Our Coco Sleek range leaves frizzy hair feeling super sleek and smooth. Feel up to 72 hours of smooth, frizz-free, fairytale hair. Frizz is controlled in damp weather and leaves hair smelling divine. Enriched with natural ingredients extracts: Coconut Oil & Cocoa Butter. Vegan formula: No animal derived ingredients or by products. 100% recyclable bottles. 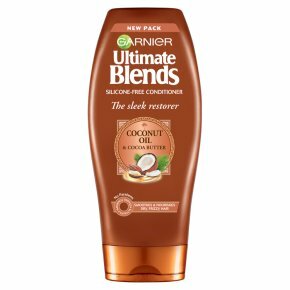 Garnier Ultimate Blends Coconut Oil & Cocoa Butter frizzy hair products - The Sleek Restorer: our ultimate frizzy hair products blended with coconut oil and cocoa butter for naturally beautiful hair. - Hair looks super sleek and smooth for up to 72 hours* (*Instrumental tests on Shampoo, Conditioner & Hair Oil) High humidity and wet weather can leave your hair feeling frizzy and unruly! The Sleek Restorer is our ultimate remedy to smooth and nourish dry, frizzy hair. Garnier Ultimate Blends Coconut Oil products for frizzy hair are enriched with natural extracts of coconut oil & cocoa butter. Each blend combines well-known, trusted ingredients to complement each other. Enriched with coconut oil and cocoa butter from the Ivory Coast, The Sleek Restorer has deliciously-scented, velvety formulas to tame and nourish dry, frizzy hair. Discover The Sleek Restorer's naturally derived ingredients: Derived from the tropical coconut, coconut oil is well-known for its nourishing properties. Garnier Ultimate Blends Coconut Oil also combines rich cocoa butter, gathered from the far reaches of the Ivory Coast. It is renowned for taming frizzy hair and flyaways, and leaves your hair smelling divine.